You know the routine. Your body goes into shock the first day of Ramadan.All of a sudden, one morning you wake up before the time for Fajr Prayer, devour your food up until the last second before the time for FajrPrayer comes in, pray your Fajr Prayer, and then, before anyone can say “Ramadan mubarak,” you’re back under your warm covers, dreaming about iftar. When you wake back up later that morning and go about your day, your body is in shock. It has no idea why all of a sudden you won’t quench your thirst. Or why you won’t grab that candy bar—you know, the one with the layers of chocolate, then caramel, then peanuts, then more chocolate, and yes, a wafer somewhere in-between. Your mouth waters, you are salivating uncontrollably, and yet you know you can’t eat because it’s Ramadan and you’re fasting! That’s right, somehow you forgot to warn your body that for the next month you’d be experiencing a special routine of praying, fasting, reading the Qur’an, being more generous, and exercising self-restraint. News flash: Ramadan is but a few days away and we all need to start getting ready! So take this as a friendly reminder and begin to set aside Monday and Thursday, in the tradition of our beloved Prophet Muhammad (peace and blessings be upon him), to keep fast. We are reminded by the Prophet’s wife`A’ishah that the Prophet Muhammad (peace and blessings be upon him) “used to fast for so long that we thought he would never stop fasting, and he would go without fasting for so long that we thought he would never fast again. I never saw the Messenger of Allah, may Allah bless him and grant him peace, fast for a complete month except for Ramadan, and I never saw him do more fasting in any one month than he did in Sha`ban” (Muwatta of Imam Malik, Book 18, Number 18.22.56). 1. The Qur’an was revealed in the month of Ramadan. 2. The Qur’an is a guidance for mankind. 3. It provides clear proofs for the guidance of the criterion between right and wrong. 4. Once the crescent for the month of Ramadan is sighted, we have to fast that month. Among the countless blessings associated with Ramadan,one that should not escape us is the fact that Ramadan is the month in which the Qur’an was revealed. This beautiful book of guidance is ours, so let us strive this coming Ramadan to draw closer to Allah by increasing our reading of the Qur’an and increasing our voluntary prayers. This month is blessed because of the countless opportunities we have to mention the name of Allah. 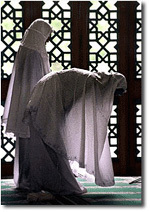 The Prophet (peace and blessings be upon him) stated that “no people gather in a house from the houses of Allah, reciting the Book of Allah and studying it amongst themselves, except that tranquility descends upon them, mercy envelops them, the angels surround them, and Allah mentions them to those that are with Him” (Sahih Muslim). Think back to this past year, all the way back to last Ramadan. What has been your relationship with the Qur’an? How often were you reading the Qur’an? What efforts did you make to memorize portions of the Qur’an? What specific surahs or verses had an impact on you this past year? Take some time to write down your responses to these questions as you prepare for Ramadan. Be frank with yourself because the responses are known only to you and Allah. Let your responses also be a checkpoint of some sort so that you can compare them with this Ramadan. Ramadan presents to all of us an opportunity to develop a personal routine as a result of efforts of maximizing self-restraint and enhancing self-development. Why exactly is it important that we spend time reading the Qur’an? First, in Ramadan the mood around us is very advantageous for reading and reflection. Throughout the year, we might read on our own, sometimes in a rush, sometimes heedlessly. In Ramadan people are trying to complete reading the entire Qur’an in one month. In addition, abstaining from food and drink helps us to suppress our lowly desires in pursuit of higher level, intellectual and spiritual desires such that we can actually reflect upon the meaning of the verses we are reading from the Qur’an. That reflection is intended to help us to internalize the teachings of the Qur’an to the degree that all aspects of our lives are aligned with those teachings. Second, reading the Qur’an consistently in one month also helps us to establish a routine that we can use throughout the year, which has direct and practical implications on our daily lives. Think about routine activities such as eating and drinking or speaking and sleeping. It is possible to imagine that in a state of hunger and thirst, one might be prone to be cranky or end up feeling a little impatient with people. But both Qur’anic teachings and the teachings of Prophet Muhammad (peace and blessings be upon him) direct us to focus on higher-level benefits of fasting. One of the benefits that the Qur’an tells us of is that fasting helps us to strengthen our consciousness of Allah, and without that state of consciousness we could be prone to human error. But combining physical self-restraint with reading and internalizing the teachings of the Qur’an allows us to attain ultimate consciousness of Allah. Our beloved Prophet Muhammad (peace and blessings be upon him) teaches us that “fasting is not merely abstaining from eating and drinking. Rather, it is also abstaining from ignorant and indecent speech. So if anyone abuses or behaves ignorantly with you, then say: I am fasting, I am fasting” (Sahih Ibn Khuzaymah and Al-Hakim, who authenticated it). Finally, reading the Qur’an helps us to reinforce and review passages that we might have already memorized or passages that we are attempting to memorize. It is ascertained that during each Ramadan, the angel Jibreel used to review the Qur’an with Prophet Muhammad (peace and blessings be upon him). And in the last Ramadan that the Prophet observed, we know that Jibreel reviewed the Qur’an twice. There is a clear emphasis being placed on repetition and review as a source of reinforcing the retention of the Qur’an. Develop a system to record what passages you are reading, which ones you are reviewing, and which ones you are memorizing. In sha’ Allah, by the end of Ramadan you will have a solid account of how well you performed! As noted above, Prophet Muhammad (peace and blessings be upon him) increased many voluntary actions in the weeks preceding Ramadan such as fasting more, praying more, and giving more in charity. You have to understand that a marathon runner does not begin a race by showing up at the starting line and waiting to hear “on your mark, get set, go!” On the contrary, the race begins many days, weeks, and months before the actual race. The preparation is strenuous and helps to build stamina so that the runner can focus on the race itself and not be distracted by his legs feeling tired or his mouth feeling parched. Similarly, starting off Ramadan by going straight to Tarawih Prayers on the first night is like showing up for the marathon unprepared. And that is why it is important for us to begin now in engaging in individual voluntary prayers. Learning to read lengthy passages of the Qur’an as we stand in prayer will help us to develop stamina as well as help us to focus on what we are reading. Indeed, we know from Abu Hurairah that “the Messenger of Allah (peace and blessings be upon him) used to encourage us to pray at night in Ramadan, without making it obligatory. Then he said, ‘Whoever prays at night in Ramadan out of faith and the hope of reward, all his previous sins will be forgiven.’ And who amongst us is not in need of having his or her sins forgiven?” As we pray daily in Ramadan,we end up developing the stamina that will, in sha’ Allah, carry us through the year until the next Ramadan. The key here is to make every effort to wake up and pray Witr at the end of the night, but there is flexibility for those who fear not being able to wake up. Despite our best intentions, some of us will make mistakes and will not be able to wake up in time for the night prayers. And unfortunately, sometimes we might even miss the Fajr Prayer. Allah knows best our intentions, but we should make sure we don’t become so relaxed that we don’t do our best to wake up, and then feel no remorse. If we keep in mind the ultimate goal is to please Allah and to have our past sins forgiven, in sha’ Allah, all of us will strive to increase our voluntary prayers. If you have not yet asked yourself whether you’re ready or not, Ramadan is around the corner, so start today and prepare to welcome it. It is critical that you do your best to train yourself with fasting, praying, reading the Qur’an, and giving charity, so that, in sha’ Allah, when Ramadan does come, you’ll be able to focus on the blessings of the month and not be distracted by your inability to exercise self-restraint, or your inability to stand for long periods of time in salah, etc. Being young, you might also be tempted to overdo the fasting, the reading of the Qur’an, and the praying to the extent that you put your physical health at risk. Exercise balance, and remember that you are trying to please a merciful Lord. Worship with faith and strive ceaselessly, hoping for Allah’s reward. Make this coming Ramadan better than your previous Ramadan, in sha’ Allah!